The disorder will recognise an abnormal fixation on gaming. 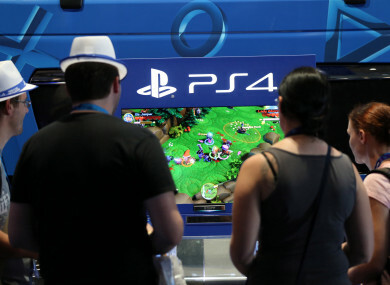 Visitors play Sony's Playstation 4 at Gamescom in Cologne. “GAMING DISORDER” WILL be recognised as a disease later this year following expert consensus over the addictive risks associated with playing electronic games, the World Health Organisation has said. The current working definition of the disorder is “a pattern of gaming behaviour, that can be digital gaming or video gaming, characterised by impaired control over gaming, increased priority given to gaming over other activities to the extent that gaming takes precedence over other interests,” Jasarevic said. Other symptoms include “the continuation and escalation of gaming despite the occurrence of negative consequences”. The provisional guidelines say that an individual should demonstrate an abnormal fixation on gaming for at least a year before being diagnosed with the disorder, which will be classified as an “addictive behaviour”, Jasarevic said. Anecdotal evidence suggests that the condition disproportionately effects younger people more connected to the ever-expanding online gaming world. “Gaming disorder is a relatively new concept and epidemiological data at the population level are yet to be generated”, he said. Despite the lack of hard data, “health experts basically agree that there is an issue” and that official inclusion in the ICD is the next appropriate step, Jasarevic said. “There are people who are asking for help”, he added, noting that formal recognition of the condition will help spur further research and resources committed to combatting the problem. Email “An addiction to video games is to be classified as a disease”. Feedback on “An addiction to video games is to be classified as a disease”.